What a bizarre holiday you are, Halloween. 364 days a year we teach our children not to talk to strangers, not to go up to stranger’s homes and never to take candy from a stranger. Yet on this one day a year, all rules are obsolete. Instead we say, “Hey kids! Go ahead and talk to strangers. Go right up to their homes. And why yes, by all means, eat their candy!” For young children and especially children with special needs — it can be quite confusing. Last year the weather was dreadful in Indianapolis. 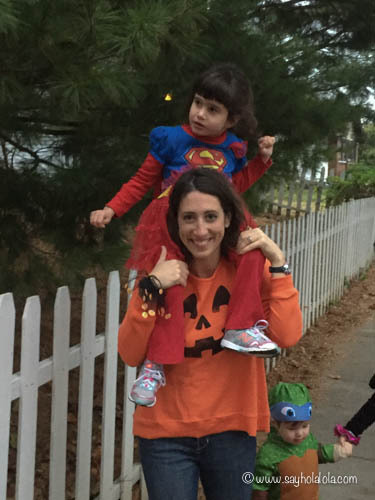 It was sleeting, it was cold and there was no way I was going to make my then 3-year-old and 10 month old endure Trick-or-Treating. This year I really wanted both Lola and Sebastian to experience it. I’m not quite sure why as it’s not like either would feel as if they were missing out on something. I think many times as parents we make our kids do things to fulfill something within ourselves and clearly Trick-or-Treating was one of them for me. But we were given an opportunity to take the kids to a Trunk-or-Treat (basically candy/items passed out of a car trunk) event specifically for kiddos with special needs and their siblings. I was excited to take Lola as many of the vendors were agencies we already work with. The afternoon was chilly and Lola had already had a seizure that day. But she didn’t seem deterred from enjoying an adventure so off we went. It was fun to see many familiar faces and it was quite comforting to be in an environment where our family wasn’t ostracized because of Lola’s occasional meltdown. 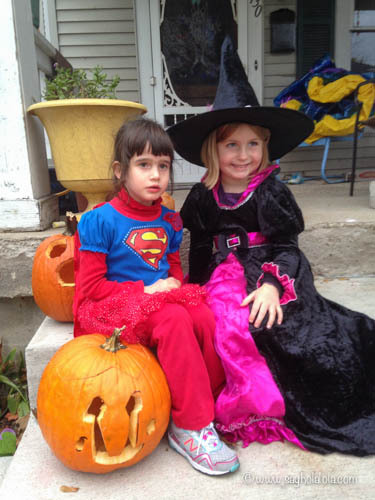 We chose to dress Lola up as Supergirl since she is a strong, independent, resilient little girl. 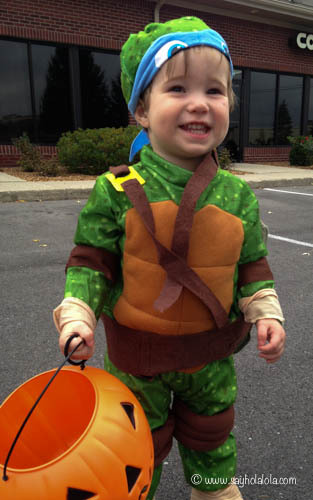 She embodies the true meaning of a “Supergirl.” Sebastian went as the Teenage Mutant Ninja Turtle, Leonardo. This preview of Trick-or-Treating was sort of a success. 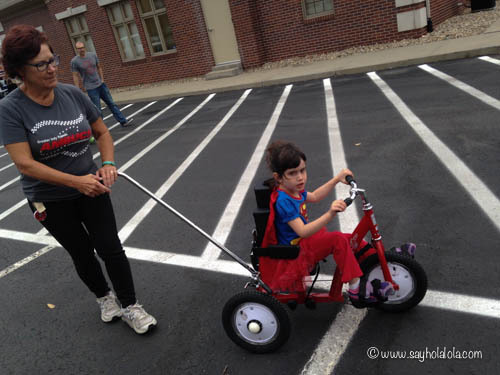 It began to rain so that put a damper on the event, but the kids got to do fun things like check out a firetruck, look inside an ambulance, Lola was fitted for an adaptive Ambucs bike (fingers crossed we get one!) and Sebastian learned that saying “Trick-or-Treat” meant he received candy. I felt as if the event was good practice for Halloween…or at least I told myself that. On Halloween night, we began to explain what the evening had in store for them. Sebastian was adamant about not wanting his costume on and Lola was bewildered as to why she was getting dressed when bath time is what usually followed after dinner. But the doorbell rang and the neighbor kids were ready to go so off we went. 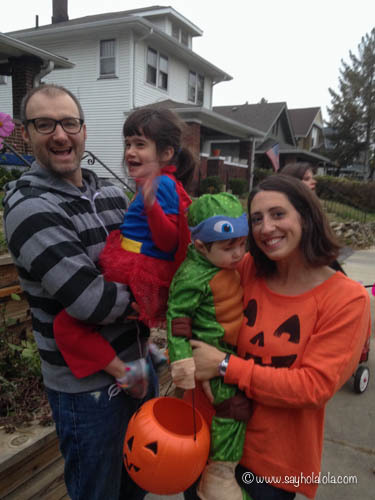 The best part of Trick-or-Treating on Halloween was that we were in our own familiar neighborhood and the kids got to Trick-or-Treat with their friends. Sebastian was all about holding hands with Lola’s friend, Paisley, so the evening was relatively simple for him. He probably could have went to 100 more houses if we had let him. For Lola, it was ‘tricky’ hence my clever blog title name. We spend a lot of time outside as a family and much of that time is spent teaching Lola boundaries. This includes etiquette while on sidewalks, not going into the street, not touching people’s cars parked on the street and, most importantly, not going up to people’s homes. 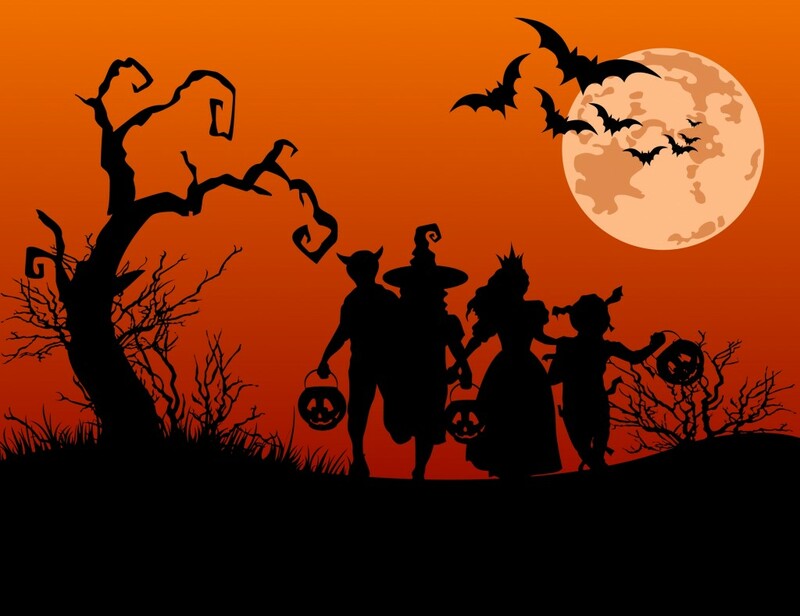 So the first few houses of Trick-or-Treating were relatively harmless because she wanted to follow her peers and she knew the neighbors, but things got a little hairy from there. We would go up to the homes and then she would try to actually enter the home or she wouldn’t want to leave the porch. She would then get upset when we left the home to go onto to the next. I could feel her frustration because she was confused. I started to get a sinking feeling as if I had made a mistake, but we were with good friends who also understood Lola’s frustration so that helped. And our neighbors were so gracious with Lola. Even though we had practiced “Trick-or-Treat” for weeks, those words couldn’t come out on cue at the homes. The people still gave her the candy and I’m fairly certain some gave her a few extra pieces. Many know of Lola and they know the challenges she has faced. I’m proud to say that our neighbors never gave looks of pity — if anything they shared looks of compassion. I felt included in our neighborhood. By the end of the evening, I felt tuckered out from carrying Lola on my shoulders and my emotional state may have been a bit spent as well. Lola and Sebastian spent the rest of the night playing in the front yard with the neighbor kids. I love that Lola is just included in that group of kids. It will take kids like that to help show others the importance of inclusion and the concept of simply being nice. After Lola and Sebastian went to bed, Rob and I raided their candy like any good parent would do and we watched old reruns of The Munsters. We reflected on Halloween and how ironic the holiday is. I felt guilty because I wondered why I had put Lola through the experience, but I already knew the answer to that. When you have a kid with exceptional needs, sometimes you just want life to feel monotonous and normal. I just wanted Lola to be included in the evening and now looking back — I’m actually glad she experienced it. While it wasn’t a picture perfect night, I do believe she had some fun. She’s still enjoying the candy she received and by golly, she is still saying her version of “Trick-or-Treat” when she sees her pumpkin pail. I was worried that she would begin to go up to random houses after the evening, but I’m proud to say she and I were outside for over two hours yesterday and she only tried to go up to the usual house — Paisley’s. I share this story publicly because pictures on social media can be deceiving. The day after Halloween, my mom said, “Halloween looked like it was fun. Did Lola like it?” I let out a chuckle thinking back to the night. Nobody wants to see pictures of kids crying on Facebook. And the purpose of this blog is to be real. Was Halloween fun? Well, yes part of the evening was fun. 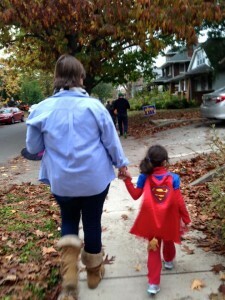 Am I glad I have an entire year until we attempt Trick-or-Treating again? You’re damn straight I am. But I’m proud of Lola. She was put in an unfamiliar situation and she did her best — as did I. We’re all still learning about what we can handle and not handle, what we like and what we don’t like. Lola will never learn what’s expected of her if we don’t give her opportunities. And the world will never know how to be cordial and accepting of people with special needs if we hide her. 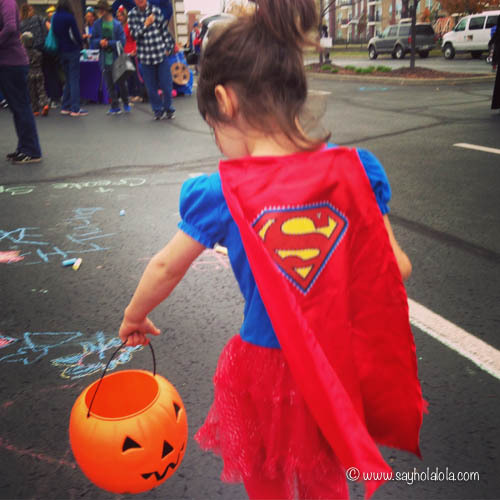 Lola is an exceptional human being and donning the Supergirl costume was appropriate because the little girl is here to make a big difference. She’s certainly my superhero! And if it turns out Halloween is not her holiday — well then that’s fine too. I’ve always been more of a Christmas soul, myself. Thanks to Timehop, I came across this gem. 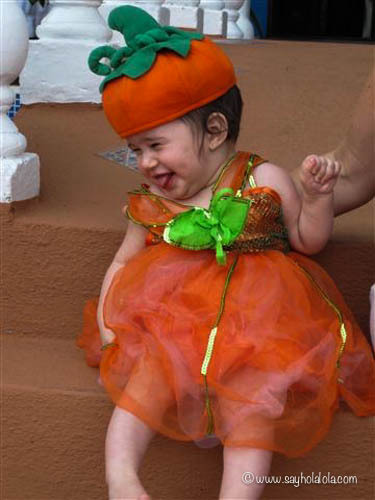 It was Lola’s very first Halloween! She was a Pumpkin Princess!